Scientists in the US say they have produced a 100W 'artificial leaf' that uses sunlight to split water into hydrogen and oxygen, but costs under $50 (£31) to manufacture. The device can run on impure water, they say, making it further suited to the target market, the developing world, and raising the possibility of using the same technology for water purification. Dan Nocera from the Massachusetts Institute of Technology, US, said at the annual meeting of the American Chemical Society that he wanted to make the fast food of energy production. He explained that he gave up efficiency for 'a huge price benefit' because he designed his device specifically for the developing world. The small size and lack of wiring or engineering complexity makes the leaf very cheap to manufacture. 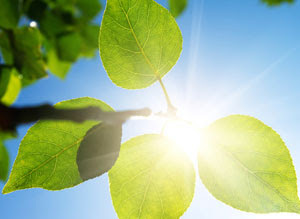 Artificial leaf systems are so called because they generate energy from sunlight by mimicking plant processes. Commercially available devices typically operate at 1kW, compared with 100W for the Nocera device, but crucially they sell at about $12,000. The leaf is a rectangle of silicon with a previously reported cobalt catalyst on one side and a new triple alloy catalyst on the other. When the leaf is placed in water, and exposed to UV light that mimics sunlight, the cobalt catalyst generates oxygen and protons. The latter diffuse to the other side of the leaf, where the new catalyst gives them the electrons needed to make molecular hydrogen. The two gases can then be stored until energy is needed. And Nocera says his leaf can use river water, sea water and even waste water - which could have implications on how drinking water, as well as electricity, is generated. Nocera says his leaf has been running continuously for a week in his lab, but further work is needed to determine longevity. He has signed an agreement with Indian group Tata to help commercialise the work.